Construction projects require good management to be successful. Project managers must deal with any number of problems that occur in the regular day-to-day organized chaos of a project site. Unexpected equipment breakdowns are one of those problems. In addition to impacts on project timelines, there is the expense of replacement equipment rental, repair or replacement. Technology, especially equipment telematics, helps to manage and reduce the risk of damaged or destroyed equipment. 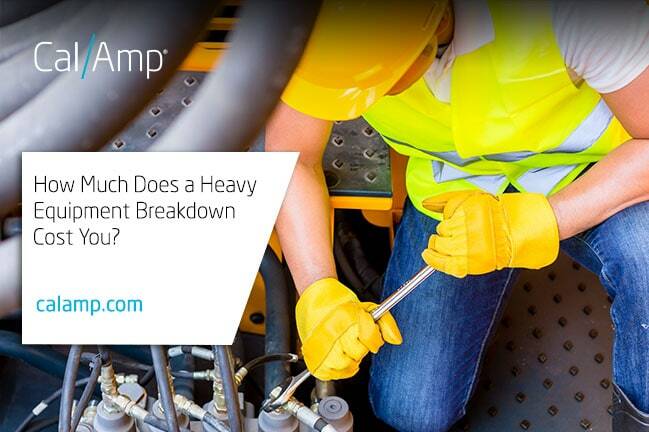 The costs of heavy equipment breakdowns are a regular concern for contractors. To minimize the risk, they must be diligent about maintaining and repairing their construction fleet. This process may include tracking how often equipment is used, noting whether any parts are malfunctioning or showing excessive wear, servicing equipment on a regular basis and ordering extra inventory ahead of time. Traditionally, all of this asset management has been done manually by inspecting equipment and keeping careful records. It can be both time-consuming and an error-prone process. Instead, the right telematics solution can streamline maintenance. The technology provides real-time information on equipment health. As a result, firms and contractors are able to reduce costs by more accurately practicing preventative, and even predictive maintenance. Inadequate maintenance often results in unexpected breakdowns, which can quickly become much more expensive than they at first appear. For instance, in addition to the cost of emergency repairs, it may be necessary to rush order parts or have them shipped from a far-away location for an extra fee. If they do not arrive on time, then the costs of an idle crew and a delayed project will also quickly add up. A study by Caterpillar® found that idle time can range from 400 to 800 nonproductive hours per year per machine. As a result, the estimated annual costs could be $1,560 up to $3,120. Even though these numbers don’t seem large, they do cut into a contractor’s margin, especially if there are five pieces of equipment idling. For equipment that cannot be repaired, the expense of renting a replacement or buying a new asset will also have to be factored into the updated project costs. For example, a used skid steer may cost between $10,000 and $40,000 per Smarter Finance USA. The site also notes that the rental of the same skid steer could run $1,000 per week. Sometimes, severe damage caused by insufficient maintenance may not even be covered in a warranty or by a construction firm’s insurance. In worst-case scenarios, a malfunctioning piece of equipment may even harm an employee or cause more extensive damage elsewhere. However, over-servicing equipment can also be expensive. For instance, scheduling regular maintenance checks, as opposed to only servicing equipment that is in danger of malfunctioning, can quickly become inefficient. Ordering excessive parts or frequently calling in technicians for minor issues can also turn into an unnecessary expense. Contractors and construction firms can avoid many of these issues with a comprehensive telematics solution which gives them up-to-the-minute visibility into their equipment health and activity. For instance, Controller Area Network (CAN) bus capabilities, as available in CalAmp’s AssetOutlook™, monitors direct engine hours and odometer readings, as well as a variety of other factors related to remotely optimizing fleet operations. All this information is then transmitted to an intelligent dashboard that can be configured to display outliers and other custom metrics, making it easy to identify any potential problems. Asset telematics solutions offer real-time notifications related to the location and utilization of equipment. For example, it can alert if any equipment is moved beyond a predefined virtual boundary or is turned on after hours. These notifications can also be sent to mobile devices, ensuring the latest fleet information is always available. The telematics data helps the crew handle a problem before it spirals out of control and allows for the proactive scheduling of maintenance. When repairs are properly handled, there is less risk and expense from unexpected breakdowns or over servicing. It also helps reduce the idle time of crew and equipment by minimizing out-of-service hours. To learn more about AssetOutlook and how it can help prevent the costs of heavy equipment breakdowns, visit our construction solution page.